Many of the top players in the game play online at a site called GridGammon. The player with the highest ranking is Petko Kostadinov, and the only surprising thing about that is that it doesn't surprise anyone! Petko has been ranked in the top 32 players in the world on the Giants of Backgammon list the past two votings, and that's pretty significant given that he does not travel internationally to tournaments as many of the other Giants from the U.S. His tournament record in the US is impressive with many fine showings in many events and consistently excellent results on the ABT Tour. People who have played Petko not only respect his game from the standpoint of technical skill, but also for his terrific insights and creativity. In discussing complicated positions with top players, I have seen Petko disagree with the bots and take a stand for a play that none of the other top players advocate, and some didn't even consider. After a long rollout and further investigation, Petko's plays generally are correct or are at least highly worthy of merit. Backgammon is a very popular game in Bulgaria where I grew up. I started playing it at the age of 11. I learned the basics of backgammon while observing my father playing with our neighbor.. The funny thing is that the first real lesson of backgammon I got from my grandmother who said, "If your opening roll is 3-1, 4-2, 5-3, or 6-4, you should always make a point." From that point forward I started playing backgammon with my best friend after school. We also played chess and santase. We kept scores in a notebook. Usually we started with backgammon. Whoever won decided whether we would play chess, backgammon, or santase next. It was very important for us to intimidate the opponent as much as possible by talking all the time. The variations of backgammon popular in Bulgaria at that time were backgammon, Gul Bara, and tapa. I like playing chouettes. My favorite chouette players are Carter, Stick and David Todd. It is always fun to play with them. Also, if it happens that they lose, they do it with a smile, which only the great players can do. The most fun win I had was against David Taniguchi who was so excited that he played standing up all the time during the final match of Pittsburg Masters Tournament in 2007. Mandatory use of baffle box. Speed backgammon for Championship and Masters. People complaining about the dice especially when they are ahead in the match. Players shuffling checkerstrying 100 ways to play a specific roll and then asking me what the original position was. Join a backgammon club. Play chouettes with world class players. Play backgammon online - I would recommend GridGammon. Buy ExtremeBackgammon and analyze all the errors you make. I play matches with friends on GridGammon and then analyze them on extremeGammon. Playing, analyzing and discussing positions on GridGammon with world class players like Ray Fogerlund, Dana Nazarian, Steve Sax, Joe Russell, Alan Grunwald, Stepan Nunyantis and others have really helped my game. Also, I know the strengths and weaknesses of most of the US Championship players and always adjust my checker and cube play depending on who I play. I plan to go to the tournaments in Michigan, Florida and Las Vegas. I plan to start playing backgammon in Europe after my son graduates from college next year. Hope to play much better and win more trophies. I love playing tapa and would love to see it one day as a side event in some of the US tournaments. We need to get younger people involved in the game. Advertise your local bg club at high schools and colleges. It would be great to have once a year a big event in Las Vegas (call it The World Cup or The World Championship) with added money and TV coverage. That would attract more European players too. Always do your best, the rest will come. Never look back, only forward. Always strive for perfection knowing that you will never be perfect. I usually spent an average of 4 hours a day playing/studying backgammon. Statistics. Travel. Soccer. I enjoy reading history. I work as a senior statistician for Hewlett Packard. I am 49 years old and I grew up in the city of Burgas on the Black Sea Coast. Graduated from an elite Math Concentration High School and Bulgarian National Naval Academy, Merchant Marine Fleet Major. Went on to become officer on a very large crude oil carrier. I also got a Masters degree in Statistics from USC. I am blessed with a loving wife and a wonderful son. We live in Columbia SC. My wife is a President and CEO of an export management company, Transcon Trading Co., Inc. My son has just finished his junior year at Duke University. My parents and an older sister are in Bulgaria and I visit them from time to time and they visit us. It all started with my wife's pursuing Masters Degrees in Political Science and Public Administration, and later on her favorite Masters of International Business Program at the renowned Mooore School of Business. My son started his first grade in Illinois. Both of them loved the USA. My wife often says that the world started making sense to her when she stepped foot on US soil. I had no choice but to follow. Never had made a better decision in my life! I owe much to Ray Fogerlund who helped me become a better player over the years. I also learned a lot by watching and playing great players like Malcolm Davis, Mike Corbett, Neil Kazaross, Kit Wollsey, John O'Hagan, Steve Sax, Ed O'Laughlin, Walter Trice, Dana Nazarian and others. I respect what Phil Simborg has done to promote the game in the US. 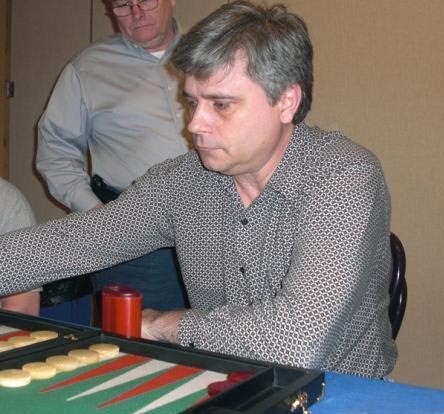 I also respect Iancho Hristov for the efforts and dedication in analyzing thousand of matches and publishing statistics of the performance of the best players in the world, and Stick Rice for dedicating so much of his time to support the best backgammon forum and becoming one of the best players in a very short period of time.